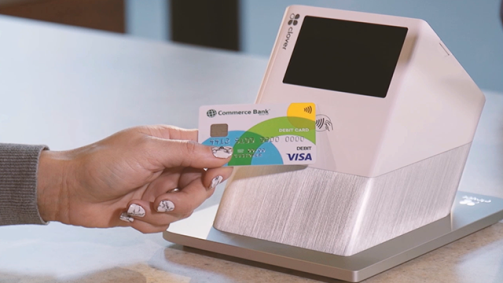 Reach for your Commerce Bank Visa® Debit Card for your everyday spending, from a cup of coffee to a trip to the grocery store. With the latest purchasing technology, you can make payments faster than ever – online and at the checkout counter. Count on built-in fraud protection with Visa Zero Liability1. Unlike cash, you're protected if your card is ever lost or stolen – and you're never responsible for any unauthorized purchases. Enroll in text Alerts to track your spending and monitor for any suspicious account activity. Lock a missing card in Online Banking to temporarily block new purchases and ATM withdrawals, without interrupting your recurring payments. Once you find your card, simply unlock it and begin using it again. Tap to pay at checkout counters that support contactless technology. You can now tap to pay at checkout counters that support contactless technology. Follow the instructions below to use your Visa® Debit Card wherever you see the contactless Symbol2 for fast, more secure3 transactions. Existing customers will receive a contactless Visa® Debit Card after your current card expires. Save time at checkout by adding your card to your preferred mobile wallet. We support the leading smart device platforms placing purchasing power in the palm of your hands. Choose a second card design to avoid confusion between debit cards for accounts with more than one cardholder. Get your card instantly.4 Replace a lost or stolen card by visiting one of our participating branches. The Contactless Symbol and Contactless Indicator are trademarks owned and used with permission of EMVCo, LLC.